Penrith Ice Palace hosts competitions, games and events for Figure Skating, Ice Hockey, and Broomball. Keep up to date with the latest events via our website or Facebook page. Thinking of starting an ice sport? Check out Skate School for more information. Penrith Ice Palace is proud to be the home rink of many talented skaters. Under guidance of Penrith Ice Palace figure skating coaches, many of these skaters are winning competitions around the country, including the Australian Figure Skating Championships. Figure Skating is a growing sport in Penrith Ice Palace. Figure Skating is a unique sport where skaters need to master both athletic fitness and the artistic expression, which makes figure skating not only eye pleasing, but one of the most exciting and technically difficult sports in the world. There are many branches of figure skating including singles, pairs, ice dance, synchronised skating, and theatre on ice. Figure sessions are training sessions for figure skaters only. To join our figure sessions, a rule acknowledgement form is to be completed and handed to staff at the front office. Please click on the link below to download a copy. All coaches must bring their APSA card to coach. Passes are only available to purchase for Penrith Club (PVFSC & SIT) members. 10 Entry Passes are to be presented to a staff member at the front desk when you sign in. If you do not have your pass with you then you are to pay for the individual session. The monthly passes are available from the beginning of each month and are valid for figure sessions during that month only. All pass purchases are non-transferable and non-refundable. Terms and conditions apply. Management reserves the right to change session times and prices as required. All skaters skate at their own risk. Private coaching are one on one lessons with an Australian Professional Ice Skating Association (APSA) accredited coach. The cost is usually $35 or $40 for a 30 minute lesson plus the admission fee for the session (See SESSION TIMES AND PRICES). To book a private lesson or for availabilities and prices, contact the coaches below. ​In order to compete in any sanctioned event throughout the year, you must be a member of your local figure skating club and NSWISA. Second hand skates and costumes are available for purchase through the club also. To become a member of Penrith Valley Figure Skating Club, you must complete a membership form and return it with the fees to the front office. For a copy of the membership form and fees please visit our canteen noticeboard or www.penrithvalleyfigureskatingclub.com. All PVFSC enquiries should be directed to penrithvalleyfigureskatingclub@gmail.com. See the table below for upcoming figure skating competitions held at our rink. For all enquiries regarding competitor registration, please contact NSWISA or PVFSC. Pretend for a moment, that you are agility, witnessed by many, duplicated by few from where you stand. You are untouchable. Creativity is your game. Unpredictability is your weapon. And somewhere between stop and go, cut and turn and shoot and score it all comes together. Expect the unexpected! Learn and play the world's fastest team sport under the guidance of experienced coaches at Penrith Ice Palace. ​Our program has been developed to teach you new skills and improve your game, with our main emphasis on having fun. We recommend all beginner skaters attend our skate school program until completion of Level 4. Basic skating skill is required (must be able to do hockey stops, forward and backward crossovers, and two foot turn backwards to forwards). All skaters participating in the Ice Hockey Development must be age 15 or above. Full protective gear must be worn at all times. All participants must sign in and pay at the front office upon arrival. The first two goalies on the night are free but are still required to sign in. As with all sports, there is always a chance of injury. Please evaluate this risk prior to participating. Scroll down on PDF if it doesn't load or click the link below to download. Popular recreational ice game originating in Canada and played around world. 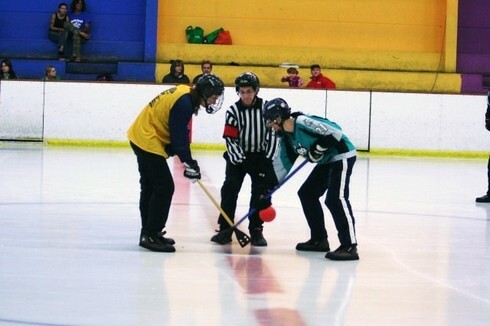 It is an ice sport is similar to ice hockey but instead of players wearing skates, players wear special rubber-soled shoes and a ball is used instead of a puck! Skate School is run during NSW school terms only. There are no Skate School sessions during the school holidays. Our Skate School program is open for all ages. 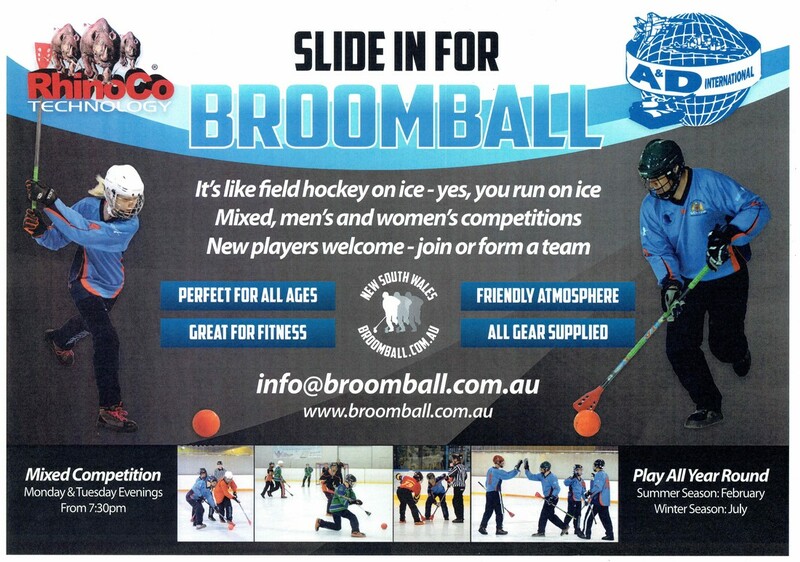 The classes are arranged by skating ability and are coached by APSA (Australian Professional Skaters Association) accredited coaches. ​Each class includes 30 minute lesson + 30 minute practice + skate hire if required. Skaters progress individually, meaning they can move up a level at any time. Progression is tracked on cards for each level. Once each skill has been learnt, it will be marked off and approved by the coach. You can move up as soon as the all skills for the level have been coach approved. Complete an enrolment form and return it to the front office prior to first lesson. A completed enrolment form is required by all skate school participants once every calendar year. See below for downloadable enrolment form or pick one up from our office. We recommend arriving 20 minutes (30 minutes for new enrolments) prior to start time to ensure signing in, payment and putting on skates are all completed before the lessons start. 2nd, 3rd and 4th person must be immediate family members of the 1st person and purchased at the same time to receive consecutive discount. Each pass is valid for one skater only and will not be replaced if damaged or lost. They are non-refundable and non-transferrable. Passes will not be accepted after the expiry date. This offer is only available to skate school students when purchasing a skate school pass for the same person. Practice pass is only valid until the end of the current school term.